Isabel Vargas Lizano (born April 17, 1919) is a Costa Rican-born Mexican singer. She is especially known for her rendition of Mexican rancheras genre - a folkloric musical genre widely popular in Mexico - but she is also recognized for her contribution to other popular Latin American song genres. She has been an influential interpreter in the Americas and Europe, muse to figures such as Pedro Almodóvar, hailed for her haunting performances, and called "la voz áspera de la ternura", the rough voice of tenderness. Isabel Vargas Lizano was born in San Joaquín de Flores, Costa Rica. She goes by Chavela, which is a nickname for Isabel. At 14, she fled her native country due to lack of musical career opportunities, seeking refuge in Mexico, where an entertainment industry was burgeoning. For many years she sang on the streets but in her thirties she became a professional singer. In her youth, she dressed as a man, smoked cigars, drank heavily, carried a gun and was known for her characteristic red jorongo, which she still dons in performances. Her first album, Noche de Bohemia (Bohemian Night), was released in 1961 with the professional support of José Alfredo Jiménez, one of the foremost singer/songwriters of the Mexican cancion ranchera. Vargas has recorded over eighty albums thereafter. 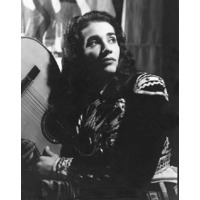 She was hugely successful during the 1950s, 1960s and the first half of the 70s, touring in Mexico, the United States, France and Spain and was close to many prominent artists and intellectuals of the time, including Juan Rulfo, Agustín Lara, Frida Kahlo, Diego Rivera, Dolores Olmedo and José Alfredo Jiménez. She partly retired in the late 1970s due to a 15 year-long battle with alcoholism, which she has described in her autobiography (Y si quieres saber de mi pasado And if you want to know about my past, published in 2002) as "my 15 years in hell" At 81 years old, she publicly declared that she was a lesbian. Vargas returned to the stage in 1991, performing at the venue "El Habito" in Coyoacan, Mexico City,. She debuted at Carnegie Hall in 2003 at the age of 83 at the behest and promotion of Spanish director Pedro Almodóvar, a long-time admirer and personal friend of Vargas. She is featured in many Almodóvar's films, including La Flor de mi Secreto in both song and video. She has said, however, that acting is not her ambition, although she had previously participated in films such as 1967s La Soldadera. Vargas recently appeared in the 2002 Julie Taymor film Frida, singing "La Llorona" (The Cryer). Her classic "Paloma Negra" (Black Dove) was also included in the soundtrack of the film. Vargas herself, as a young woman, was alleged to have had an affair with Frida Kahlo, during Kahlo's marriage to muralist Diego Rivera. She also appeared in Alejandro González Iñárritu's Babel, singing "Tú me acostumbraste" (You Got Me Used To), a bolero of Frank Dominguez. Joaquín Sabina's song "Por el Boulevar de los Sueños Rotos" ("Through the Boulevard of Broken Dreams") is dedicated to Vargas.